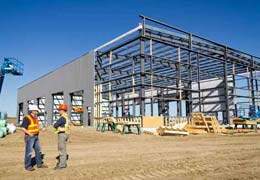 Steel is, without a doubt, your best choice when constructing a building for industrial purposes. Pre-engineered steel buildings will save you money, while improving your LEED Environmental Sustainability score in 5 categories out of 6. Take the time to explore these photographs of steel factories, warehouses, and other structures, to get a sense of the diverse options available to industrial customers. If you are planning an industrial warehouse or chemical storage building, we suggest you visit the Industrial section of our Blog, to view articles on these subjects. Take time to note the different styles of structures in our gallery, bearing in mind that each design has its own features and benefits. If vast areas of unobstructed (clear span) floorspace are what you are after, then you may want to go with a Gabled or Single-sloped Rigid Frame design. On the other hand, if you may wish to expand your structure later, a Beam and Column design will make this relatively painless. 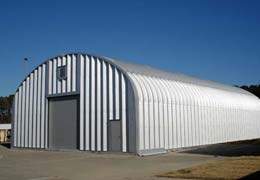 For sheer monetary savings and unparalleled sturdiness, the Arched Quonset Hut design is prescribed. To learn more about your design choices, visit our Buyers’ Guide Designs section! Whatever your purpose, you will not find a better choice on the market than steel for an industrial building.